MUNICH SHOW: Cambridge Audio NP30 network music player on sale in UK next week | What Hi-Fi? Cambridge Audio's long-awaited NP30 network music player, revealed at CES 2011 in January, will finally go on sale in the UK next week for £399.95. The NP30 enables 24-bit audio playback, has access to streaming music services and internet radio stations, and offers a free remote control app for iPhone, iPod Touch and iPad. It can be connected to your home network via ethernet or wi-fi. We have also been given a sneak preview of an Android version of the app here in Munich. It's still in the development stage but should be available later this year. 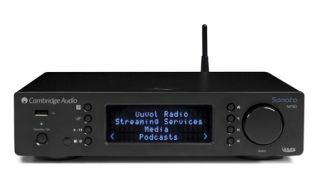 It ships with a range of popular internet services onboard, including Aupeo!, BBC iPlayer Radio, Pandora, Rhapsody and MP3Tunes. Additional services will continue to be added to UuVol, says Cambridge Audio. The NP30 will also stream audio from any UPnP-equipped device, including 24-bit/96kHz support for studio quality uncompressed files, plus AAC, FLAC, MP3, Ogg Vorbis and WAV formats. Our news ed Joe Cox is in Munich with Cambridge Audio today, so we'll bring you more details as soon as we get them.